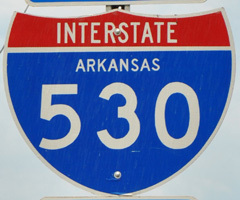 Interstate 530 connects Little Rock with Pine Bluff along a 35 mile long course south along the Arkansas River valley. The rural freeway is also U.S. 65, but Arkansas Department of Transportation (ArDOT) signing practices omit the overlap. Plans call for eventual extension of I-530 south to the future Interstate 69 corridor at Monticello. Two sections of the future route are completed. Arkansas State Highway 530 spurs 23.6 miles south from the Pine Bluff Bypass to Highway 11 southwest of Star City. Measuring 4.5 miles, the southern segment of Highway 530 links Highway 35 with U.S. 278 west of Monticello. Both segments of Highway 530 travel at-grade with two lanes. The proposed extension of Interstate 530 from Pine Bluff south to Monticello (Interstate 69) is part of High Priority Corridor 18: NAFTA Superhighway (Section (18)(C)(ii)). The northern ten miles of I-530 predate 1970. Interstate 530 was approved by AASHTO on November 14, 1997, as a future route between U.S. 65 south of Pine Bluff and I-30 south of Little Rock. Interstate 530 was commissioned August 2, 1999 over the preexisting U.S. 65 freeway on the same day that the western portion of the Pine Bluff bypass opened to traffic. Interstate 530 is a direct result of the “Dickey Split” compromise, which proposed access to the Interstate 69 / NAFTA corridor from Pine Bluff.1 The southern extension of Interstate 530 parallels U.S. 425 to the west from Star City to Monticello. Originating in Pine Bluff, U.S. 425 was commissioned in 1989. The interim designation is Arkansas 530. During the elections of November 2, 2004, Jock Scott was soundly defeated at the polls, carrying only 16% of the vote. Incumbent Representative Rodney Alexander won with 59% of the vote. Interstate 530 & U.S. 65-167 cross Granite Mountain ahead of the exchange with I-30 and I-440 in south Little Rock. Photo taken 05/20/14. Ramps for I-30 west to Hot Springs and I-440 east to Bill and Hillary Clinton National Airport (LIT) separate from the north end of Interstate 530 nearly simultaneously in one half mile. Photo taken 05/20/14. Left Exit 1B departs from Intestate 530 beyond Fourche Creek, a tributary of the Arkansas River. I-30 travels west another 12 miles across the city of Little Rock to the Saline County line at Exit 126. Photo taken 05/20/14. Interstate 30 comprises a trucking corridor and regional freeway joining Little Rock with Texarkana and Dallas-Forth, Texas. Photo taken 05/20/14. Interstate 440 stems east from the northward turn of I-30 into Little Rock along the Eastbelt Freeway to College Station, the Port of Little Rock and I-40/Highway 440 at North Little Rock. Photo taken 05/20/14. Interstate 30 heads south from I-630 and Downtown Little Rock and meets I-440 east and I-530 south 1.25 miles beyond Exit 139A with Highway 365. Photo taken 05/07/12. Continuing south over a Union Pacific Railroad yard, I-30 approaches the split with U.S. 65/167 at Interstate 530 (Exit 138). Photo taken 05/07/12. Interstate 30 turns west and merges with traffic from the end of I-440 toward south Little Rock and Mabelville. I-440 arcs northeast to LIT Airport and I-40/Highway 440 in North Little Rock. Photo taken 05/07/12. Interstate 30 curves northeast through the multi level interchange with I-440 east and I-530 & U.S. 67/167 south toward Downtown Little Rock. I-440 bypasses the city east to LIT Airport and I-40 at North Little Rock. Photo taken 05/07/12. U.S. 65 & 167 combine with Interstate 530 south from I-30 at Exit 138B to Saline County. U.S. 167 branches southwest from there to Sheridan while U.S. 65 remains along I-530 to Pine Bluff. Photo taken by Chris Patriarca (05/03/03). Interstate 440 westbound concludes beyond the left exit for I-530 & U.S. 65/167 south to Sweet Home and Pine Bluff. Photo taken 05/20/14. 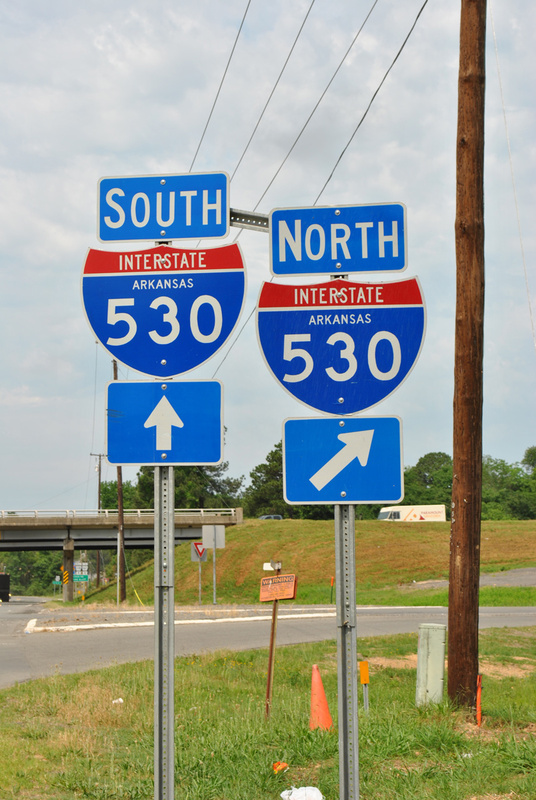 Interstate 530-U.S. 65 south and U.S. 63-79 north angle northeast from the directional T interchange with Arkansas 530 to Exit 46 with Arkansas 190 west, U.S. 65 Business north and U.S. 425 south. Photo taken 05/07/12. A flyover separates at Exit 46 for the continuation of U.S. 63/79 north to the Arkansas County seat of Stuttgart. The I-530 mainline turns eastward along U.S. 65 and U.S. 425 toward Dumas and McGehee. Photo taken 05/07/12. Exit 46 partitions with a left side ramp to Highway 190 west along Harding Avenue. U.S. 65 Business combines with U.S. 63/79 northward for a half mile. Photo taken 05/07/12. U.S. 65 north transitions into Interstate 530 at the multi level interchange with U.S. 63/79/65B north and Arkansas 190 (Harding Avenue) west. Northbound U.S. 425 ends here. Photo taken 05/07/12. U.S. 63 was extended southward to Bastrop, Louisiana in late 1999. Overlapping with U.S. 79 from Stuggart, U.S. 63 overlaps I-530 & U.S. 65 north to bypass Pine Bluff en route to Warren. Photo taken 05/07/12. Arkansas 190 navigates through the Pine Bluff street grid, connecting Downtown with the commercial strip along Harding Avenue. The state highway connects with Interstate 530 north and ends at U.S. 65 south. Photo taken 05/07/12. Interstate 69 from Shreveport to Memphis, i69info.com (Chris Lawrence). “New Arkansas Highway to be dedicated.” KTHV (Little Rock, AR), June 5, 2006. “PB En Route to Having New Road.” Pine Bluff Commercial (AR), July 18, 2008. “Scott: Interstate will help economy.” Monroe News-Star (LA), October 21, 2004.